good death are the product of a reflexive project of identity. characterized by high levels of technology and consumption. Deliens, 2006a; Cohen et al., 2006b). 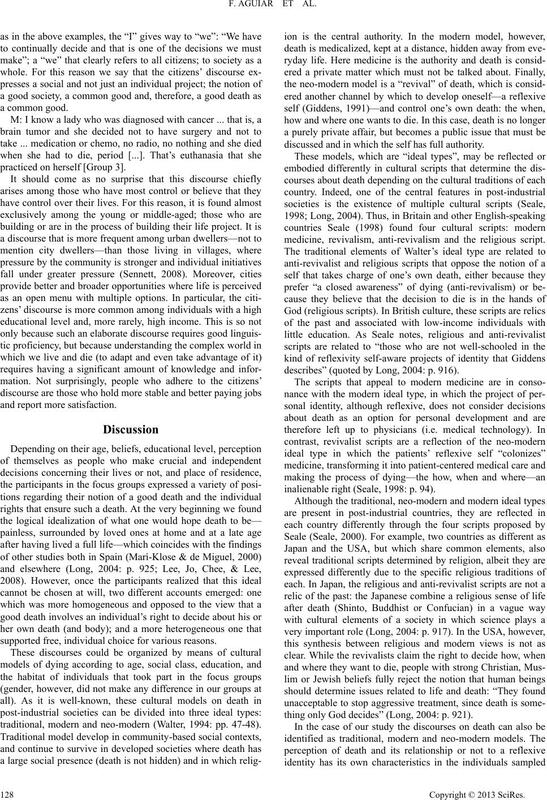 death that can guide individual decisions (Seale, 1998)? models of death and dying (Walter, 1994). autonomy in the process of dying. struct cultural scripts (Martín Criado, 1997). appear in the discourses as explanatory narrative elements. described in the Table 1.
them to a facility [Group 1]? provides even the slightest ray of hope [Group 3]. power and decision making, which are completely alien to them. W: But they don’t let you live they way you want to either. Exactly. No ... I would like to live ... to die within my means. W: Dying, you’re going to die when the time comes. Really. have to grab onto it. That much we agree on [Group 1]. only God has the power to give or take life. W: It isn’t a pleasant topic. W: It’s a sad topic. W: […] Yeah, I think a lot…but don’t talk about it. W: Talk, people talk little about these things. W: Right, and in a meeting like today, even less [Group 2]. reasons for defending such a right differ enormously. was sedated and died very peacefully [Group 2]. hand. And I think I loved my father as a son can love his father. my soul? And I said, my God, what can I do [Group 1]? hard time seeing him like that [Group 5]. life and their death, and that others should respect their decision. with the freedom of others (Berlin, Hardy, & Harris, 2002). going to die [Group 1]. W: I agree ... everyone should do what they want [Group 3]. live like that [Group 6]. are an unmet social demand. listen to me if it’s about me [Group 4]? 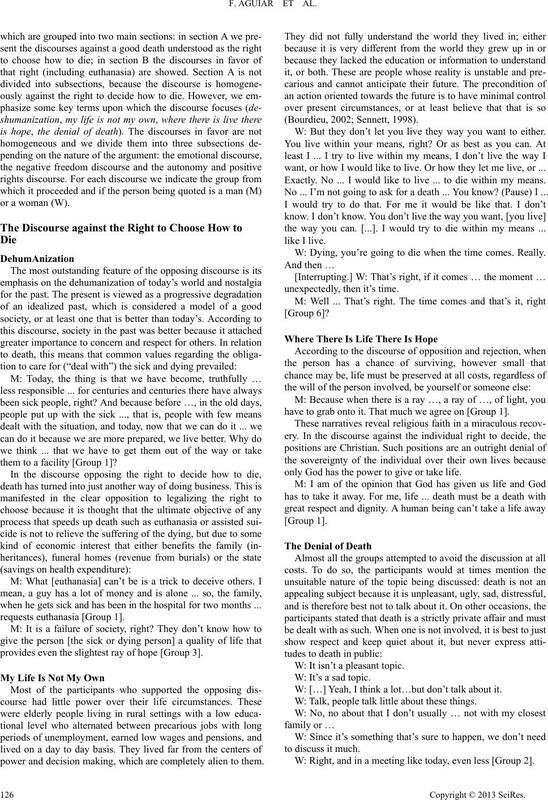 but is also opposed to discussing euthanasia or assisted suicide. what the morally right thing to do is. to do and that’s all there i s to it. don’t respect those things [Group 3]. have to do it [Group 3]. victim ... and someone has to help [Group 3]. spoken about”, “if legislation needs to be made, let it be made”). practiced on herself [Group 3]. supported free, individual choice for various reasons. traditional, modern and neo-modern (Walter, 1994: pp. 47-48). discussed and in which the self has full authority. medicine, revivalism, anti-revivalism and the religious script. describes” (quoted by Long, 2004: p. 916). inalienable right (Seale, 1998: p. 94). thing only God decides” (Long, 2004: p. 921). present in a country as developed and yet as religious as Japan. Catholics are, at the same time, revivalists. 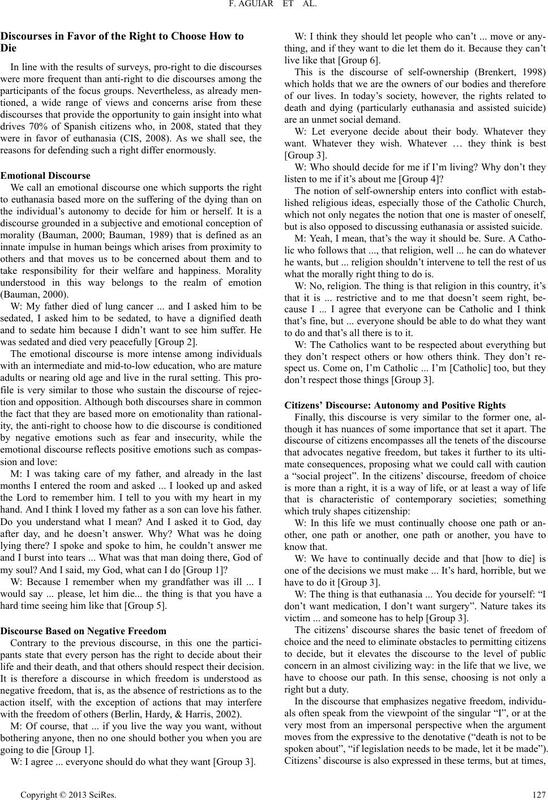 in which negative freedom forms the core of their argument. discourses, but reflected in sometimes confusing cultural scripts. bodied in a religious script, is by no means a relic of the past. which have left little time for their discussion and assimilation. one of our main research targets in the future. essays on liberty. Oxford: Oxford University Press. Bourdieu, P. (2002). Counterfire: Against the tyranny of the market. CIS (1992). Barómetro de opin i ón . Estudio n 1.996. Madrid: CIS. CIS (2002). Actitudes y opiniones de los médicos ante la eutanasia. 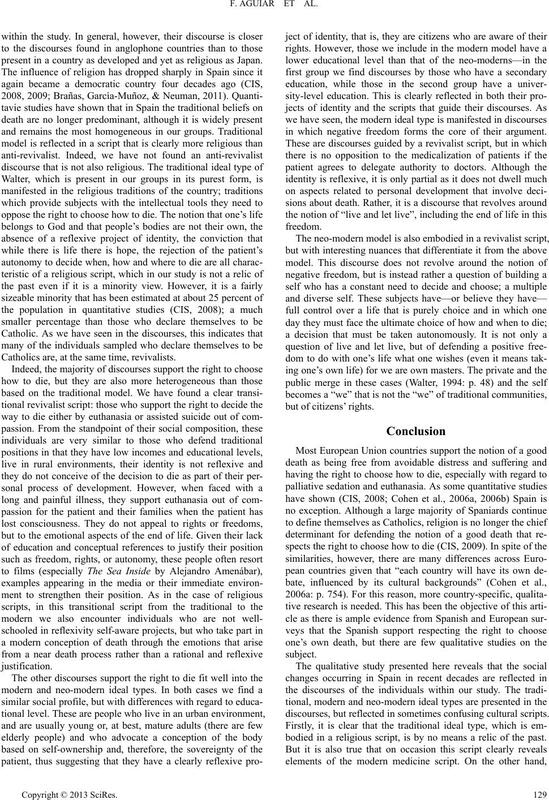 Journal of Public Health, 16, 663-669.
spectives. France: Council of E urope. tering death and dying (6th ed.) New York: McGraw Hill. late modern age. Stanford: Stanford University Press. Ramon Sampedro’s case. Bioethics, 13, 426-432. Harrison, J., & David C. (2004). Spain: A modern European economy. at the end of life. Washington, DC: National Academy Press. Q-methodological appro ach. 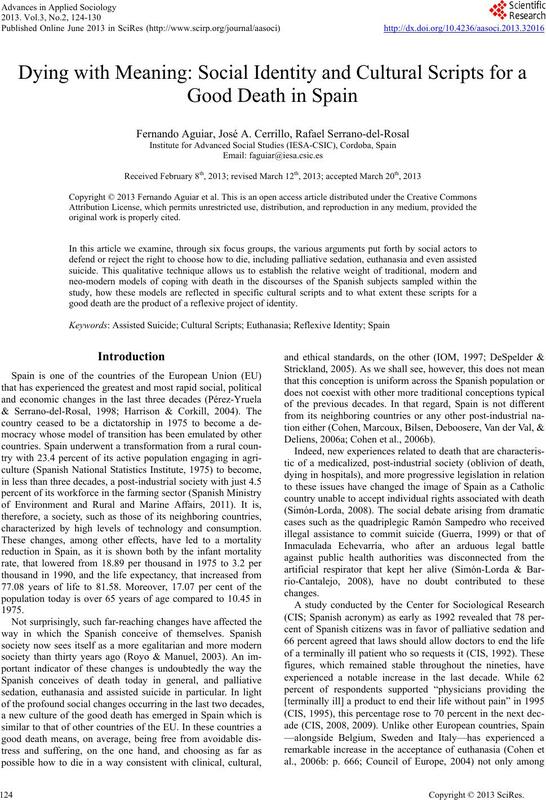 Death Studies, 32, 870-890. Martín Criado, E. (1997). El grupo de discusión como situación social. 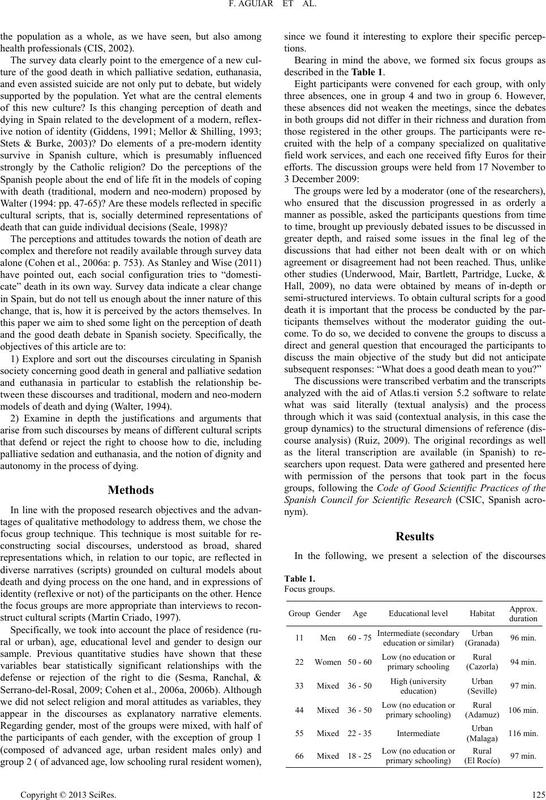 Revista Española de Investigaciones Sociológi cas, 79, 81-112.
secuestration of death. Sociology, 27, 411-431. Union: The first fifteen years. London: R ou tle dg e.
Ruiz, J. (2009). Sociological discourse analysis: Methods and logic. reavement. Cambridge: Cambridge University Press. quences of work in the new capitalism. New York: Norton. Sennett, R. (2008). The uses of disorder: personal identity and city life. ciudadanía andaluza ante la legalización de la eutanasia. In A. M.
y Cambio (pp. 185-204). Sevilla: Ce ntro de Es t u dios Andaluces. Spanish Ministry of Environment, and Rural and Marine Affairs (2001). mestication thesis and domestic figuration. 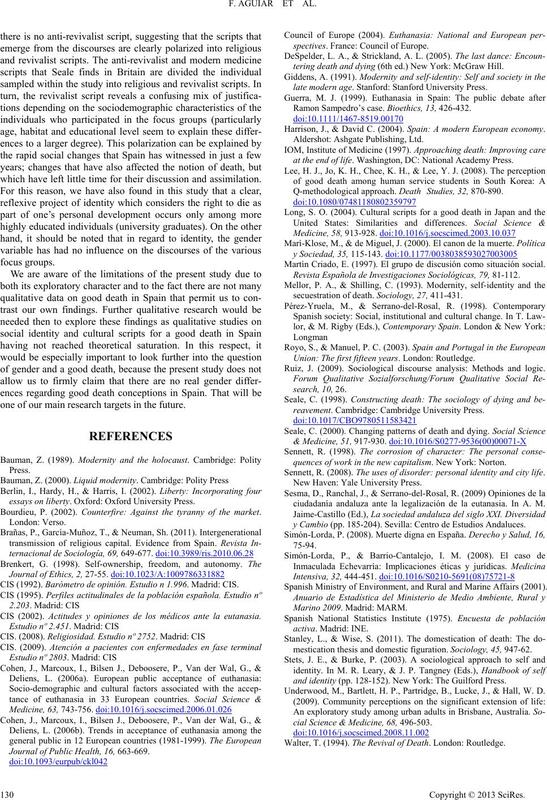 Sociology, 45, 947-62.
and identity (pp. 12 8-152). New York: The Guilf o rd Press. Underwood, M., Bartlett, H. P., Partridge, B., Lucke, J., & Hall, W. D.
cial Science & Medicine, 68, 496-503.